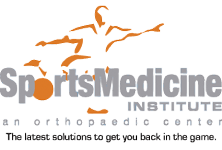 Sports Medicine Institute Sports Injuries and Arthroscopic Surgery of the Hip, Shoulder and Knee. Schedule your appointment with Dr. Lucas, Dr. Nowicki, or Dr. Feiner at Sports Medicine Institute today. We are open 8:00 am to 5:00 pm Monday through Thursday and 8:00 am to 4:00 pm on Friday. We provide prompt care for emergencies and may be able to offer you a same-day appointment.